An increasing number of patients are missing out on vital MRI scans due to a majority of scanners not being able to accommodate for overweight or obese patients. NHS chiefs have announced that one health board alone has had to forfeit over 200 MRI scans since 2014 because the scanning equipment was not adequate for the growing obese population. The Chief Executive of the Society of Radiographers, Richard Evans, said that obesity is increasing extra pressure on the NHS across the whole of the UK. “It causes inconvenience to waiting lists – particularly if it’s not clear the patient will not fit in the machine until the day of the appointment itself,” he said, in an interview with the BBC. Missing vital MRI scans could put patients’ lives at risk. Scanning equipment across the UK has not been modernised to cope with increasing rates of obesity. Data released in March 2018 showed that over 60 per cent of British adults are overweight or obese. 26 per cent are classified as obese. That means that one quarter of the population would not fit into a standard MRI scanner – a 60cm round tube is barely wide enough to accommodate an average male’s shoulder span of 46.5cm. Standard scanners can also only hold a maximum of 25 stone, whereas open scanners are built to accommodate larger patients. Open MRI scanners, like the one at Newcastle Clinic, are big MRI scanners designed to serve obese patients. Open MRIs have no walls and feature a wide area for the patient. The table is more than twice the width of a standard MRI. 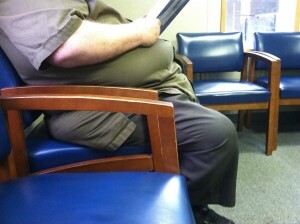 We accept NHS referrals for both obese and claustrophobic patients. Our open scanner is the only one in the North East of England, Cumbria and Scotland, and we can accept patients from all over the UK.